The Challenge: Build a 3D printer in a weekend using tools and materials available in a typical art store. 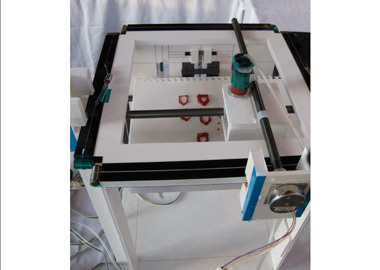 Technical Approach: While on a trip to Maker Faire in Austin, Texas, I was amazed by several do-it-yourself CNC projects which had been constructed by people with little or no formal engineering training. Many of their design choices would have likely been instantly overlooked otherwise... and yet, their machines worked and were capable of producing useful objects. This visit caused me to ask: how has my fear of design failure obcsured my vision, and what is the lowest-end but functional 3D printer that I could construct? 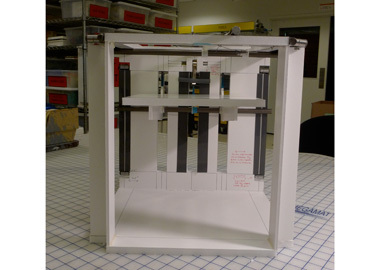 Foamcore is a very low risk material, meaning that the cost of errors (measured both in time and money) is low enough that wild experimentation becomes possible. Armed with an exacto knife, a hot glue gun, and around $90 worth of materials, I spent a weekend designing and building and never touching a sketchbook or solid modeling program. 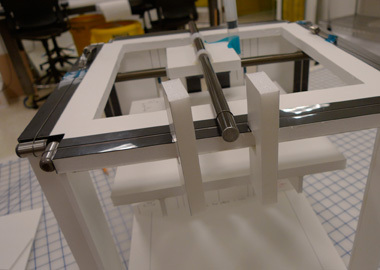 Selected Design Features: Two perpendicular shafts roll on delrin laminated foamcore, causing movement of a toolhead located at their intersection. Thin steel cables are wrapped once around each end of both shafts and stretched taut by hose-clamps-turned-tensioners. The purpose of these cables is to utilize the capstan effect to force the shafts to roll rather than skid. This both stabilizes the shafts and permits small pancake stepper motors to be directly coupled to the shafts. The motors are mounted with double-stick adhesive on foamcore plates which straddle the shaft bearing surfaces. Backlash was mostly eliminated by mounting the motors in situ. 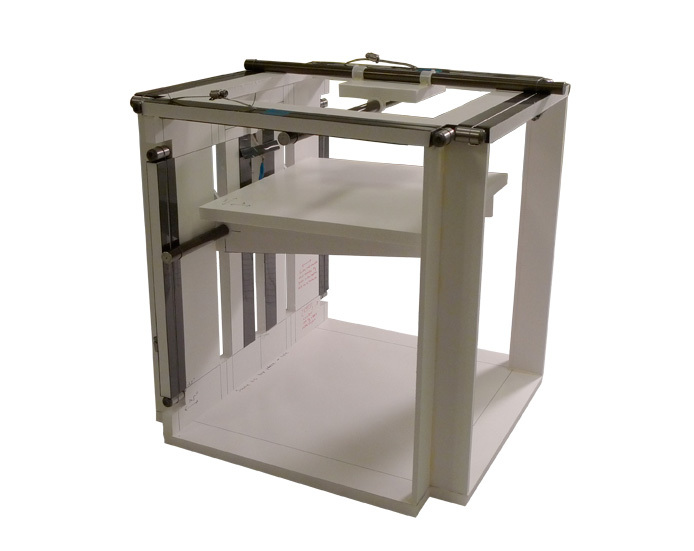 The Z axis is driven by a similar capstan mechanism, but is also provided with a constant force spring to counterbalance the weight of the moving table. 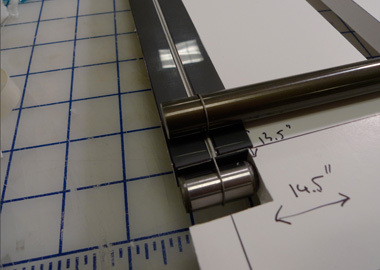 Step resolution on all axes is 0.015" with full steps, and 0.007" using half-stepping. 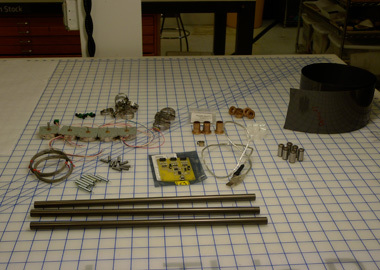 Around $90 of components and materials are necessary to construct the machine. 0.018" diameter cable runs in a groove between two delrin bearing surfaces. This groove is responsible for resisting small lateral frictional forces. Hose clamps are used as cable tensioners. The motor is mounted to the bearing fingers in-situ, which takes up most of the backlash. 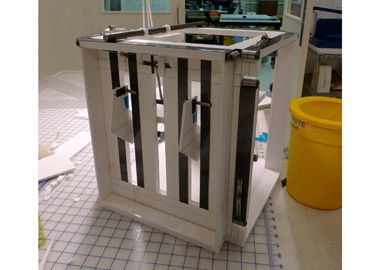 The table is actuated by a similar mechanism as the XY stage, with some assistance from a constant-force spring. 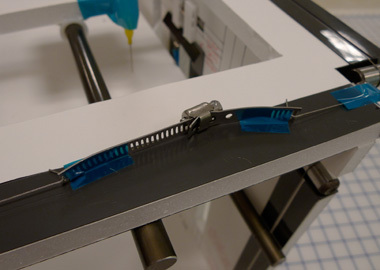 Long dowel pins riding on delrin strips bear the cantilevered weight of the table. 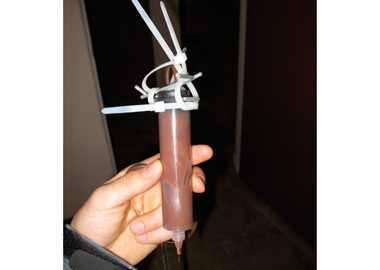 The first material extruded by this machine was chocolate pudding. This photograph was taken after a bumpy car ride, but shows the first print: a layered pentagonal house. I presented the Foamcore CNC at Maker Faire 2009 in San Mateo, CA. I also brought the machine to Gadgetoff 2009 in NYC. Ketchup was the new material of choice.